Afghan singer and musician Aryana Sayeed was on Saturday night honored with an Atlantic Council 2018 Freedom Award at a gala event in Berlin. Aryana, who defied a Taliban fatwa and performed for more than 3,000 people in Kabul last August, dedicated her award to two recent victims of gender violence in Afghanistan and ended the evening with a brief performance. She said at the event: “The fact that I, as an Afghan female artist and a human and women’s rights activist, can step in the middle of a football field in Kabul and perform. . . where not so long-ago women were viciously executed. . . is a clear indication that progress is being made.” Sayeed dedicated her award to two recent victims of gender violence in Afghanistan and ended the evening with a brief performance of a Farsi song celebrating the power of women. Other recipients of this year’s award were former US Secretary of State Madeleine Albright, the International Women’s Media Foundation (IWMF), which supports female journalists around the world with training and fellowships, and raises awareness of the dangers they face when reporting the news, and nine-year-old Syrian war refugee Bana Alabed, who used Twitter to raise awareness about the Syrian War and the siege of Aleppo. The Atlantic Council Freedom Awards recognize extraordinary individuals and organizations that defend and advance the cause of freedom around the world. Inaugurated in Berlin on the 20th anniversary of the fall of the Berlin wall, the 2009 Freedom Awards recognized the efforts of the American, German, Polish, Czech, and Slovak people, as well as the allied troops of NATO, to bring about a peaceful end to the Cold War. From 2010 to 2017, Wrocław, Poland served as the European home of the Freedom Awards in recognition of Poland’s unique role in spreading the message of solidarity and freedom across Central and Eastern Europe. Each year the awards celebrate past triumphs of freedom, but also those who continue the struggle today. 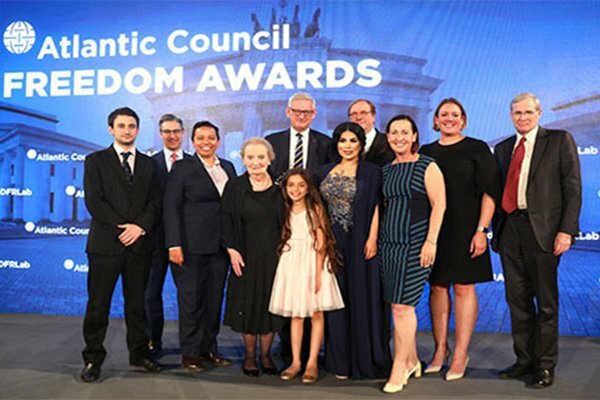 In 2018, the Atlantic Council brought the Freedom Awards ceremony and gala dinner back to Berlin, the city at the heart of Europe that continues to shape and define the notions of freedom, democracy, and human rights for a new generation of informed citizens and leaders. Aryana is a singer, songwriter, and TV personality from Afghanistan. Born in 1985 in Kabul to a Pashto speaking father and a Dari speaking mother, Aryana left her country when she was eight years old. Her family migrated to Switzerland via Pakistan and it was in choirs in her Swiss schools that Aryana realized she wanted to make a career out of singing. In 2008, she rose to fame with the release of her first single “MashaAllah”. After the release of her song “Afghan Pesarak”, she became a household name among Afghans. Since then, she has performed regularly in concerts, TV shows, and philanthropic festivals, both within and outside of Afghanistan. In her brief career, Aryana has already won multiple awards, including Best New Female Artist of the Year, Best Female Artist of the Year (five times), Best Live Performer, Best Song of the Year, Best Video of the Year, and Best Afghan Woman Icon. In 2013, Aryana was granted the title of “Star of Voice” (Sitara-e Aawaaz) by the International Afghan Artists Association. Aryana’s music videos have obtained millions of views on YouTube and she also has the biggest following of any Afghan artist on Instagram with more than 330,000 followers, and her Facebook fan page is within the top category of Afghan artists worldwide, with more than 1.8 million followers. In addition to writing and composing her own songs, Aryana is also credited with being the first Afghan artist to have their songs broadcast internationally on TV channels such as MTV World, BBC World, and Al Jazeera. Aryana has performed close to 100 concerts worldwide including inside Afghanistan. She is also the first Afghan artist of the new generation to have brought back “live performance” inside Afghanistan, despite opposition. Aryana is considered a role model for up-and-coming Afghan artists and is known for her humanitarian activities such as charity concerts, openly defending the rights of Afghan women, and raising awareness of the ongoing social issues and challenges within Afghanistan. Afghan singer Aryana Sayeed was one of four “freedom activists” honored with the prestigious award at a function in Germany.